In a shocking incident, two cousins were killed after being hit by a speeding truck on Gill Road last night. The victims have been identified as 25-year-old Kamal Verma and 21-year-old Amit Verma, residents of New Aman Nagar and Gobind Nagar in the Shimlapuri area. Kamal’s sister Indu’s wedding was scheduled for Friday. Parveen Kumar, elder brother of Amit, said the duo was purchasing cloth material for Indu’s wedding. "When they reached near Dyal Sweets on Gill Road a speeding truck hit them. 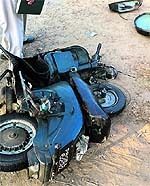 Kamal, who was riding a motorcycle lost control, and they fell on the road and were crushed under the truck. They died on the spot. The killer truck has ruined our lives," said Parveen Kumar. "Nothing can be more tragic than this. Our celebrations turned into mourning," said Parveen. Fate has played a cruel joke on the families of both the victims. Kamal was the only breadwinner of the family. He was putting up at a rented accommodation at Street No 1 in New Aman Nagar Kamal along with his mother Veena and sister Indu. "His father Bal Krishan left the house nearly 13 years ago. The family kept hoping that he would return one day, but he didn't. Kamal started believing that his father is dead. They were living in penury and Veena raised her children with great difficulty. She did odd job to provide best education to Kamal and Indu. Kamal got a job at Sahnewal and was earning well. After a long lull, there was celebration in their house. But destiny had something else in store," said a relative. Amit's father Shamsher Singh, too, died of tuberculosis four years ago. After his father's death Amit left studies and started helping his elder brother Parveen to run the house. Amit was working at a cloth manufacturing unit in industrial area. The police has registered a case under Section 304(A) of the IPC against the driver of the truck. A 55-year-old auto-rickshaw driver died after a speeding mini-truck hit his vehicle on National Highway-I near Dana Mandi on Friday. The victim has been identified as Bhajan Singh, a resident of the old city area. He was on his way to Jodhewal Basti Chowk when the incident took place. Eyewitnesses said the mini-truck hit the auto and Bhajan Singh lost control over the vehicle and it overturned. He died on the spot. The driver of the mini-truck managed to flee. A case under Section 304-A of the IPC has been registered against the driver of the mini-truck. The deceased have been identified as 27-year-old Ranjit Singh and 28-year-old Jagdeep Singh, both residents of Fatehghar Siwian village near Jagraon. The unidentified car driver fled from the scene leaving the car behind. He was absconding till the filing of this report. Ranjit Singh and Jagdeep Singh were going towards their village on a Vespa scooter (PB-25-A-6292) from Jagraon. As they reached near the closed sugar mill, it collided with a Maruti SX4 car (PB-04-L-0550) coming from the Moga side. Some passers-by called the 108 Ambulance which rushed both the victims to the Jagraon Civil Hospital where they were declared brought dead. Investigating officer ASI Baldev Singh said the police has registered a case under Sections 279, 304 (A) and 427 of the IPC. The incident took place at around 11 am today. The injured has been identified as 14-year-old Depinderdeep Singh, a student of a private school at Mullanpur Dakha. Deepinderdeep hails from Changal village. Sources said Deepinderdeep received critical injuries on his head. He was immediately rushed to a private hospital in Ludhiana from where he was referred to Dayanand Medical College and Hospital (DMCH). Sources in the DMCH said the condition of Deepinderdeep was critical and he was put on a ventilator in the ICU of the hospital. Victim’s grandfather Darshan Singh said the school authorities informed them about the incident. "Deepinderdeep has been put on a ventilator and is unconscious. The doctors told me that Deepinderdeep’s condition is critical," said Darshan Singh. 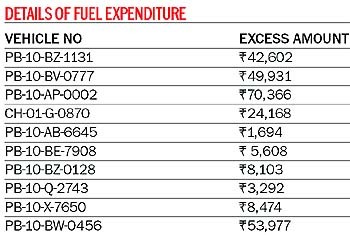 The MC Commissioner, Joint Commissioners and other officials are wasting public money as their vehicles are consuming more fuel than their prescribed limit of 290 litres per month. Information procured under the RTI Act revealed that many senior MC officials exceeded the prescribed limit of 290 litres, which had cost the civic body Rs 2.65 lakh. In a letter issued by the Accountant General (Audit), Punjab, it has been stated that the excess expenditure should be recovered from the officials concerned. The Motor Vehicle Board of the state government has fixed the consumption of petrol at 290 litres per month per vehicle. A letter (number SS-I/2012-13/AP-3/59) issued from the office of Accountant General (Audit), Punjab, has clearly pointed out the excess expenditure by MC officials. “During test check of records of logbooks of vehicles and petrol bills of Bansal Filling Station, Ludhiana, for 2011-12, it was noticed that consumption of petrol is more than 290 litres per vehicle per month. This resulted in excess expenditure of Rs 2,65,235, which may be recovered from the officials to whom the vehicles are allotted. Further, due to shortage of time, it is requested that similar cases of such nature may be examined at your own level under intimation to audit,” read the letter of the assistant audit officer sent to the MC on October 22. The matter was brought to the notice of the civic body’s building branch by a resident of the area. MC officials visited the spot and urged the managing committee of that religious place to stop the illegal construction. However, the managing committee of the religious place termed the construction legal. The committee members said they were renovating the structure and claims made by the MC building branch were baseless. When contacted, Subhash Duggal, president of the committee managing this religious place, refuted the allegations and said they were renovating the structure. “Some area residents have been harassing us. The building branch officials had visited the spot yesterday to inspect the structure. We told them that the construction would go on as we were not flouting rules. Moreover, if MC officials think that there is encroachment on the road, they can come and take measurements,” claimed Duggal. A building branch official said the managing committee members had submitted a building plan in 2008. “But it could not be cleared because the plan was not as per the building bylaws. We had gone to inspect the spot yesterday evening, but the managing committee members challenged and said they would not stop the construction,” said the official. Mayor Harcharan Singh Gohalwaria said for him, all religious places were same. “If any religious place in Sarabha Nagar is involved in illegal construction, it must be stopped. If the managing committee members should get the building plan sanctioned,” added the Mayor. Barring any procedural hiccups, the refreshment room might become operational again in January and passengers can look forward to have freshly cooked meals and snacks at moderate prices. Senior railway officials said that tenders inviting bids for refreshment room at the Ludhiana railway station along with Amritsar and Jalandhar (all Category-A stations) have been invited from catering contractors. The bid documents and detailed tender notice have been uploaded at the railway website. The bids will be received till January 4, 2013, and opened immediately thereafter, the officials said. However, going by the rates of meals, snacks and beverages sold at the refreshment room, which are fixed by the railway authorities, the annual contract amount for Ludhiana at Rs 15.60 lakh seems on a high side, feel some of the prospective bidders. Requesting anonymity, a former railway contractor said the previous contractor, who had been running the refreshment room for several years, had quit after persistent losses as he was unable to recover even his input cost when the monthly lease money was around Rs 30,000. “With almost four times hike in the lease money, the chances that someone would come forward to run the refreshment room are thin unless a proportionate increase in sale prices of food items and beverages are allowed, the contractor said. The railway officials, however, justify the increase in the yearly contract amount. "We shall keep our fingers crossed and wait till the closing date of bids. The matter will be reviewed, if required, once the bids are received." As the refreshment room is closed for the past several months and the food plaza set up at the main entry gate of the railway station being too far away for passengers and other visitors to the railway station, they have no other choice but to turn towards the railway vendors who at times resort to overcharging and also sell poor quality of eatables. Commuters and other regular travellers badly miss the meals and snacks which used to be served at the railway refreshment room. "Although a variety of food items and snacks are available with the vendors at the railway platforms, one still longs for breakfast, lunch and dinner as well as other snacks and beverages served at the refreshment room," said a regular visitor to the railway station. Deputy Commissioner Rahul Tiwari was asked to appear personally at the hearing today. The six houses, allotted by GLADA at Dugri, are occupied by Surjit Singh and his associates, where they also run shops and offices. The houses were allotted to six other riot victims. When they went to take the possession of the houses, they found that Surjit Singh and others had already taken the possession, following which they moved the High Court. The High Court ruled in favour of the original allottees, but Surjit Singh and others moved the Supreme Court in July-August against the High Court’s decision. The damaged tanks were replaced and the area around one of the tanks that was being used as a urinal was cleaned here today. The officials of the Operations and Maintenance (O&M) branch of the civic body were caught off guard when the Mayor conducted a surprise check in the Zone D building last evening. Out of the five water tanks, three were without lids, while one was leaking continuously. The Mayor was further shocked to see that the area under one of the tanks was being used as a urinal by the MC staff, despite the fact that urinals are located on all the floors of the Zone D building. After this surprise check, the Mayor had directed the O&M branch officials to get the tanks covered and replace the damaged water tanks. Ravinder Garg, executive engineer of the O&M branch, said that two water tanks that were damaged have been replaced. “I have told my staff to keep a close watch on all water tanks installed in all the MC offices so that the visitors as well as officials get potable water,” said Garg. In rural areas, however, the health department might face some problems as ASHA (Accredited Social Health Activist) workers are reluctant to conduct the survey on the plea that they are being paid very less. An ASHA worker said: "Even a daily wager gets Rs 166; but the health department will pay us only Rs 200 for two weeks. This is a very meager amount." Dr Saini said: "We have also received reports that some of the ASHA workers are reluctant to work. However, there is nothing to worry, as we will get this survey done with the help of ANMs and other staff of the health department." Each volunteer will have to cover 25 to 30 houses in a day. Civil Surgeon, Ludhiana, Dr Subhash Batta said: "The volunteers will collect data about all those cancer patients who died in the past five years. They will carry a page of questionnaire with 12 questions related to cancer patient, and will also make people aware about symptoms and treatment of cancer." District Immunization Officer, Ludhiana, Dr Sanjeev Hans appealed to the public to cooperate with the volunteers and provide accurate information. The protestors accused the chairman of the bank of adopting dictatorial attitude in exercising the Rule 19(3) of SBI Officer's Service Rules at the time of retirement of officers, especially the office-bearers of the association. "Normally, this rule is applied to the retiring officials against whom some disciplinary or departmental inquiry is pending and the same cannot be concluded till the retirement of the official. The officer is, therefore, retired under the rule without giving him any terminal benefits. Misusing this rule, the bank recently retired the general secretary of the SBIOA, Mumbai Circle, and today the rule was applied on the circle presidents of SBIOA, Bhopal and Bhubaneshwar Circles,” said JP Kalra, zonal president. The allegation against these officials is that on August 8 they held demonstrations against the chairman for declaring that the bank will remain open on all the seven days of the week without having any discussions with the association. Information can be provided to Rishipal Singh, additional deputy commissioner, on 9872290882, Subhash Batta, civil surgeon, on 9815486786, or Jasbir Singh, district health officer, on 9814178569. While the bride belongs to Jamalpur, the groom’s family had come from Uttarakhand. According to people present at the venue, one of the family members of the groom demanded Rs 2 lakh just before the marriage was to get solemnised. The demand did not go down well the bride’s family and led to a heated argument between both the parties. Following the argument, the bride’s family closed the gate of the marriage palace and called the police. On seeing the police, the groom's family reportedly apologised and agreed to complete the ceremony without any delay. The marriage was reportedly solemnized in an ammicable manner finally. The groom is currently working in a company based in Chandigarh. It was Rao’s third visit to Ludhiana. Rao appreciated the love of Punjabis for classical music. "Punjabi have always been a great audience and some of the local musicians have won accolades all over the world," said Pt Shubhendra Rao. He also emphasised on the use of technology. "We have to take advantage of technology. I use tanpura application on my phone. I also have presence on social networking sites and Youtube,” he said. District president Tarlochan Singh said that small farmers of the state were facing a crisis situation as big farmers were using their power and influence to avail subsidies and other facilities meant for the small farmers. The small farmers appealed to the government to provide them with free-of-cost irrigation facilities, and waive the debt. The victim identified as Dinesh Kumar, who is a relationship manager with IndusInd Bank, was returning home from work. The victim said that when he stopped his vehicle near Sidhwan Canal in Shimlapuri area to answer nature’s call, four youths who were travelling in Hyundai Verna car stopped and alighted from the vehicle. "They told me that I had banged into their car and told me to accompany them to Dugri police station. I thought they were policemen. I sat in my car and told them to follow me. However, one of the youths trained a pistol on me. Then three of the youths sat in my car and told me to drive the vehicle. I was scared as they threatened to kill me. When the vehicle reached near Dehlon, they told me to alight from the vehicle, and drove away in my car," Dinesh reported to the police. He said, besides the car, the carjackers took away his gold chain, gold rings, two mobile phones and Rs 40,000. It was after covering a distance of over 5 kms that Dinesh could spot a roadside eatery and established contact with his family and the police. Jatinderjit Singh, SHO, Daba police station, said the case had been registered. The police is suspecting a Moga-based gang could have been behind the recent carjacking incident. Panic gripped Makkar Colony in Dhandari area here today after the residents spotted a body lying in a pool of blood. The man, who is suspected to be a migrant, around 35 years of age, could not be identified. According to the police, the deceased was murdered. The victim suffered fatal head injury, allegedly caused by sharp edged weapons. Police suspects personal enmity led to the fatal incident. The area is densely populated but none of the residents spotted the assailant. The police has launched preliminary investigation and registered a murder case against unidentified persons. Participants from over 30 schools from across the state took part in seven disciplines, including track events, long jump, shot put, javelin throw, volleyball, hockey and judo. Anish Roy, chief operating officer, Idea Cellular, gave away prizes to the winners. Guru Ram Rai Public School pocketed a cash prize of Rs 20,000 in addition to the mementoes. "The winners in all the events will be imparted training for six months by the coaches of Punjab Sports Department to prepare them for national level tournaments. This unique programme was conceptualised with an aim to recognise the talent of young sportspersons who could be prepared for future competitions," said Roy. An impressive cultural programme was the highlight of the closing ceremony. Kartar Singh Sehmbey, district sports officer, Ludhiana, informed that all the arrangements for a comfortable stay of the visiting teams have been made. As the organisers were gearing up for the prize distribution ceremony, a group of miscreants descended on the ground with lathis, hockey sticks and iron rods, and started assaulting some boys sitting there. Soon, both the groups were seen hurling sticks at each other. According to one of the participants, violence occurred in reciprocation of an eve-teasing incident, but organisers denied it.